I usually have insights while swimming or running, when I picked up cycling again, my mind was focused on techniques during the ride, looking at my progress through my endomondo. I guess those are becoming background noise, cause now I’m getting insights on the bike. Again this insights are on how the cycling itself reflected on my life. speed training – on goal setting, measurement and achievement. long slow distance – on being prepared and being disciplined. remembering a cycling accident I had. On the hill rides, I generally put on a low gear to climb up easier, as well as to lower the strain on my thigh muscles. and when going downhill, I can then use the high gear with no strain, I just have to be careful where I was going. the insight was that in life, when things get tough, I need to slow down and take it easy, if I don’t I might get burned, then I’ll stop. Sometimes after the stop I might continue, but in worst case I may give up. When I did the hill climb frequent enough, I eventually was able to maintain my speed and in some instances, I actually was able to speed up. At the top, I am relieved to have reached it, and going down hill, when life gets easy, I may take it easy, or I may choose to take advantage of the height and speed up as fast as I can, and if possible bring that momentum the next up hill battle, which would lessen the burden upto a point. There will be ups and downs in life, it matters how it is handled. In speed training, I realized that I was going at a slow and comfortable pace, I wanted to go the speed of an average cyclist. So I first found out exactly my current average speed (18-20kmph) and the average speed of an average (not amateur or beginner) cyclist, which happened to be 30kmph. Then I found out how they have achieved it, how their training regime is like, and emulate. In life, we have goals, but we need to find out where we are, and where we want to be, how we are going to reach it, and just do it. improving things a bit at time. On long steady distance rides, I needed to maintain low gear, keep my pace. I needed to prepare hydration and nutrition to maintain my energy. one time after a huge binge meal the day before, I thought I could do 100km with 1 bottle of isotonic drink. I was wrong. It only lasted a bit more than half of the ride, the last half i rationed it but it wasn’t enough, so I rode really slow and tired… and thirsty. Most of the things in life will not be reached instantly, sometimes it is a long journey, it is best to be prepared, but if it turns out it we weren’t, find out how it could have been improved, and do it next time. One time, I had a self accident. the pedal was squeaking, and I was looking at the cranks during the ride. then I noticed that a rubber cover of the hood over the breaks was peeled off. I tried to fix it, but I lost track of the road and swerved to much to the left, I tried to realign but it was too late. I rolled over with the bike, I was ok with some bumps and bruises, the bicycle had a bent handle, and some broken spokes. but from that moment on I learned to be focus on what I am doing, if there was something wrong, or I need to adjust something, I need to stop and then check it. In life there are distractions, certain distractions can pull away focus from what is important. If necessary, stop and deal with the distractions itself, then continue on the journey. 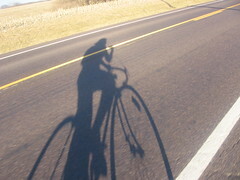 It is interesting that a simple thing like riding a bike bring insights to life and how it is lived. from the highs and lows, reaching a goal, being prepared and being focused and how to deal with distractions. I expect this is just the beginning, and I look forward to having these insights on the bike.